This screenshot comes from my MyFICO Score Watch subscription. If you consider 759 reasonably close to 760, I got this 5 months ago, right on my birthday. I obtained my first credit card in January 2012, not long after I got my first job out of college and realized I’d need to start building credit. This is the Bank of America BankAmericard Cash Rewards secured credit card, with a 2k credit limit. For the next 9 months, I learned how to manage the only credit card I had, and did some research on consumer credit. In October 2012, I applied for and was approved for 2 more credit cards: the BankAmericard Travel Rewards credit card with 5k limit and the Discover More credit card with 2k limit. Then around Thanksgiving, I got my 4th credit card: the American Express Delta Gold Skymiles, with a meager 1k limit. My friends thought I was insane for having so many credit cards. They still do. But I had done a lot of research. Having 4 cards before my credit history hit the first anniversary was crucial for my credit; they became the foundation of my credit building process. As I gained more credit history, these 4 credit cards aged together and gave me a thick credit file early on. Instead of 1 credit card reporting perfect payments, I had 4 reporting perfect payments at the same time. That’s 4 times better. This was great in 2 ways. First, I would have enough credit experience to get approved for subsequent credit cards I would apply for. Second, the newer credit accounts would have less of a negative impact on my credit profile: 4 old cards plus 2 new cards look much more mature than 1 old card plus 2 new ones. In January 2013, my credit history hit the anniversary, and my secured credit card graduated. I requested a credit limit increase on this card, and was approved for a 10k increase, going from 2k to 12k. I also requested a credit limit increase on the Amex card, and was approved for a 2k increase, going to 3k. I now had 4 non-secured credit cards with decent limits on my credit report. These include an American Express-issued credit card, which means I had locked in the 2012 membership with Amex. I went on to apply for another bunch of credit cards and was approved for all of them. Among these were 2 Amex cards which actually improved my Average Age of Accounts because I had locked in 2012 membership with my first card. This was basically the end of my first stage of credit building. I barely made a move for the next year and just let the accounts age while requesting a few credit limit increases. I was thinking of applying for an auto loan at some point, so I needed to not add another credit inquiry or new account to my credit report. Now I could have stopped at this point and been happy with just the cards I had; if I had waited long enough and not applied for other credit accounts, I probably would have reached 760 in 5 years. But with all the knowledge I had, I knew I could do better. The main weakness with my credit profile, as revealed by my FICO score report, was the lack of a mix of credit: all of the credit accounts I had were credit cards – not enough variation. This takes us to February, 2014. I was ready to buy a car. Applying for an auto loan was the first test of my credit building progress: was my credit good enough to get me the lowest interest rate? At the same time, I needed an installment loan to improve my credit mix. So let’s go for it. Results were in. I was approved for a 2.99% interest by Bellco Credit Union, the lowest rate they had. Ka-ching! The FICO score they pulled was around 740. Not only had I achieved the first primary goal of credit building, I also improved my credit profile by adding an auto loan. 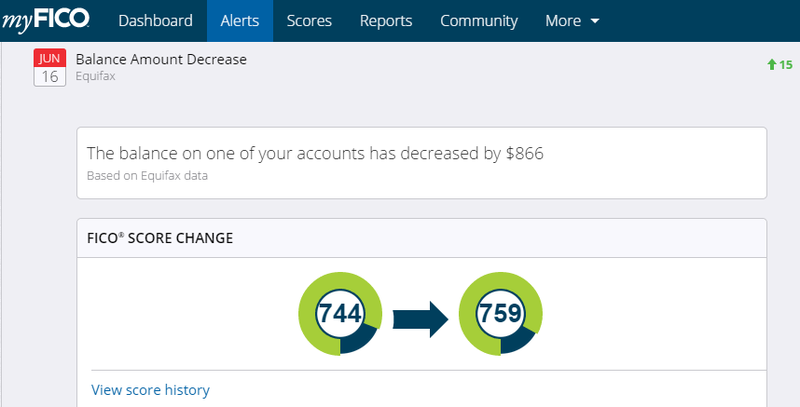 The applications and the new account lowered my FICO score by about 20 points, but I knew I would gain them back by letting the new account age and the inquiries drop. FICO takes into account inquiries that are a year old or younger. In a year, the negative impact of the inquiries would disappear. Even at 6 months, the negative impact would have significantly abated. And bingo, 6 months later, in August 2014, I exceeded the 760 threshold. I based my credit building guide partially on my personal experience. I do not necessarily advice my readers to follow the same path I did, or even a more aggressive path, because managing credit takes discipline and experience, both of which need to be built over time. Handling 10+ credit cards is just too much for the majority of the population. But I did not want to be in the majority, and that’s why I stepped into excellent credit land in just 2 years and 5 months.